Space Shogi is a three-dimensional shogi variant invented by George R. Dekle, Sr. in 1987. 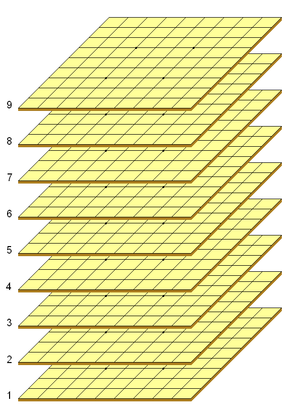 The gamespace comprises nine 9x9 shogi boards stacked vertically. Each player controls a standard set of shogi pieces. Space Shogi was included in World Game Review No. 10 edited by Michael Keller. 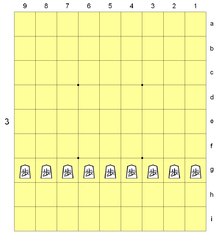 Space Shogi follows standard shogi conventions, including the same types and numbers of pieces, and a similar initial setup. All the normal shogi rules apply, including drops, promotion, check, checkmate, and impasse. But pieces have the freedom of three-dimensional movement. Black starts the game occupying levels 1 through 3; White starts on levels 9 through 7. Black's level 1 (and White's level 9, rank a) starting setup. 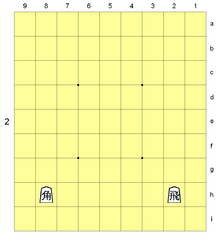 Unlike standard shogi, the silver is placed between the lance and the knight (8i and 2i in the diagram). Black's level 2 (and White's level 8, rank b) starting setup. 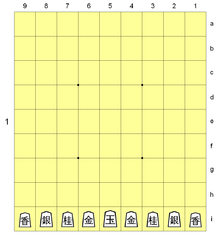 The bishop and rook occupy the same positions as in standard shogi. Black's level 3 (and White's level 7, rank c) starting setup. The pawns fill the same rank as in standard shogi.